Rap is going to have his first piano recital by November this year. 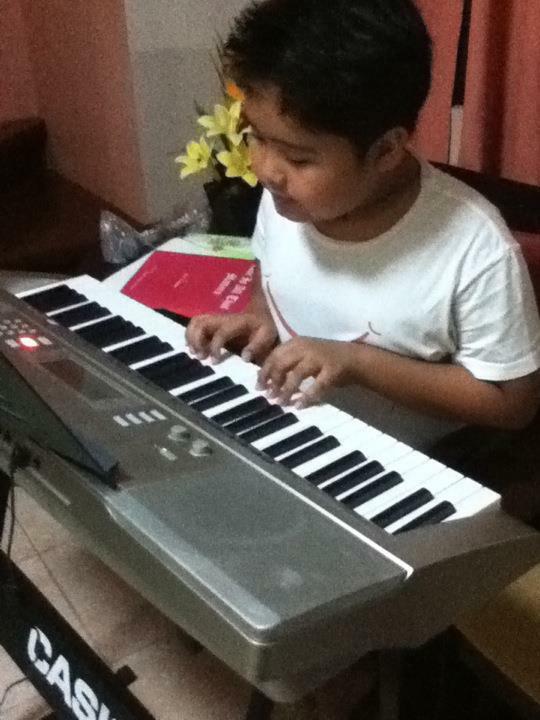 He started learning how to play the piano last summer and now he's on his 2nd level. The piano keyboard he was using was actually his lola's and only had 49 keys. After finishing the beginner's level, he started to influence us to buy him a bigger one. Luckily, I found one on sale at SM Megamall's SM Appliance Center last weekend. This unit has 61 keys and has over 150 tones and rhythms. My boy loved it because he can insert sd memory cards in its slot for recording. He can even download midi tracks from the internet for him to play and learn on his new piano keyboard. I, on the other hand, loved the fact that it only cost me Php 13,994 or Php 1,166 monthly for 12 months! Rap has been having a good time practicing his recital pieces after school. He doesn't know that I also practice in the morning when he's not home. Today, I just finished re-learning how to play "Annie Laurie" which I already played when I was younger. I think I'm going to start playing the piano again with Rap's new toy. oh! a recital.. that's so nice! left you a kiss, hope i get one back, thanks! by the way, do you mind checking out on Meal Time? Meron, hiwalay na bayad siya. Php 1,999 yung pedal na isinasaksak diyan.